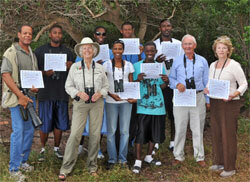 The primary focus of our birding class is to master the challenge and the process of bird identification. In a classroom setting, the proper use of binoculars is explained, a bird field guide book becomes a trusty companion for identification rather than an overwhelming source of information and the Grand Bahama Birding Checklist turns into a cherished life-long document! Each lesson is followed by the highly anticipated fieldtrip where eyes and ears of novice birders are sensitized to the wonders of nature! Interested? Be careful! You may just be taking up a rich, lifelong pursuit unlike any other! For more information and registration call Garden of the Groves at 242-374-7778.